PM Modi said, "I consider NRIs India's brand ambassadors. They are the symbols of our capacities and capabilities,"
New Delhi : Speaking at the event to mark Pravasi Bharatiya Diwas in Varanasi, Prime Minister Narendra Modi targeted the Congress by using a famous remark, once made by Prime Minister Rajiv Gandhi in 1985. He said that only 15 paise of every rupee meant for welfare of downtrodden reaches them. However, PM Modi did not mention the name of Rajiv Gandhi. He referred the comment that only 15 paise of a rupee reaches the masses and said the Congress government had done nothing to stop the leakage. "You must have heard of an ex-prime minister talking of corruption. He said only 15 per cent of a rupee from Delhi reaches villages and that 85 paise disappears. For so many years, the party that ruled the country accepted this,"
Shri Narendra Modi added that his government had stepped in to rectify the situation. The "85 per cent loot" taking place during the Congress regime had been plugged "100 per cent" through technology, he said. "We have given about Rs. 5,80,000 crore to people, transferred to their bank accounts through various schemes. Imagine, if the country was being run on the older system? Then Rs. 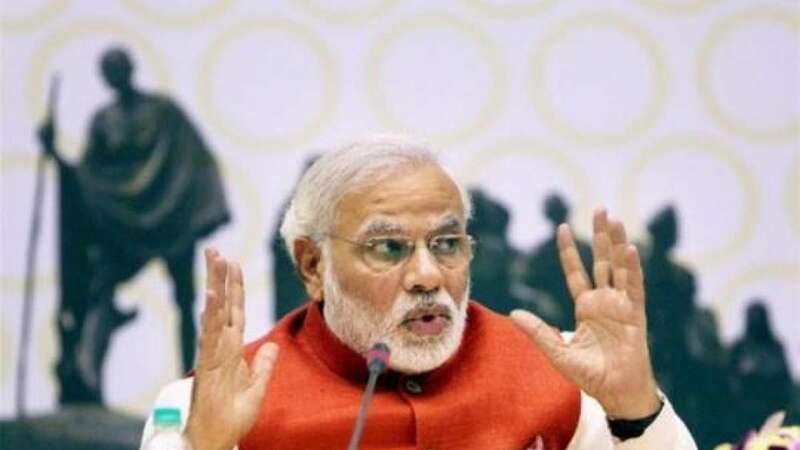 4,50,000 crore would have vanished," PM Modi said in his Lok Sabha constituency. PM Modi mentioned Non-Resident Indians (NRIs) as the country's brand ambassadors and said they were the symbols of the country's capabilities. "I consider NRIs India's brand ambassadors. They are the symbols of our capacities and capabilities," he told the gathering. "People of Indian origin are in leadership roles in countries such as Mauritius, Portugal and Ireland," he said. Earlier too, PM Modi has attacked the Congress by referring Rajiv Gandhi's comment. "Wasn't there money available before? (Road Transport and Highways) Department before? Engineers before? And people's demand before? Yet it didn't happen. Why? That's because, as one of the Congress prime ministers said, only 15 paise out of every rupee spent on development reached the villages," he had said in September last year in Chhattisgarh.